WHEN: Opening Event on Sunday, May 7, 2017, during Weekend In Old Monmouth, a weekend organized and promoted by the Monmouth County Historical Commission. During the weekend, Monmouth County historical sites will open their doors to visitors and waive their admission fees. The Museum will be open from 11:00 a.m. to 5:00 p.m. 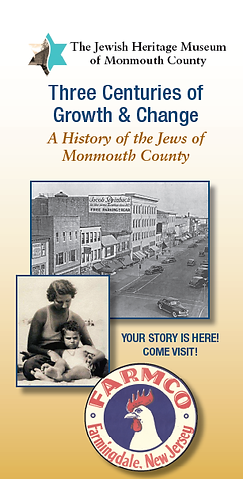 This May, The Jewish Heritage Museum of Monmouth County will unveil its new Permanent “core” Exhibit entitled Three Centuries of Growth & Change: A History of the Jews of Monmouth County. This pictorial exhibit will tell the compelling story of how the Jewish community developed from one Sephardic Jew traveling and peddling his wares in the county in the early 1700s, to a diverse community of Jews, both Sephardi and Ashkenazi, with a variety of institutions, organizations, businesses and services, and 40 active synagogues throughout the County. For 300 years, generations of Jews have contributed to the tapestry and vibrancy of life in Monmouth County in every arena: as merchants, farmers, business and land owners, engineers, doctors, lawyers, artists, rabbis, and educators, becoming full participants in the American saga. Monmouth County’s unique story includes the “Jewish Newport” at the Jersey Shore where the wealthy, “crème de la crème” of German Jews from New York City vacationed between 1870 and 1920; nationally acclaimed Jewish-owned factories of clothing and uniforms; the nation’s first ordained female rabbi, who served for 25 years in Monmouth County; and the town of Roosevelt (originally Jersey Homesteads) established in the county in the 1930s by 200 Jewish families. This town later became an artist colony. It also encompasses The Jewish chicken farmers in the county, some of whom sold their land to developers to build the houses many of us live in; the dynamic Syrian community in the shore towns; the many acclaimed Jewish artists who live and work here; as well as the notable “sons and daughters” in medicine, science, and business, who were born or grew up here. Their stories parallel that of the nation, and will therefore resonate with the whole community, no matter your background. This exhibit tells the “Story of Us”—fascinating tales of immigration to America and subsequent settlement in this county. Your story is here! Come visit! This Permanent Exhibit was a dream of the founders of The Jewish Heritage Museum at its founding eleven years ago. Many teams worked on this enormous initiative over the years, creating a vision, making plans, and collecting information, photographs, and artifacts. Now the project has finally come to fruition, executed by professionals, and also reflects the efforts of many dedicated volunteers. The current volunteer team is comprised of Michael Berman and Simon Zelingher, Core Exhibit Committee Co-Chairs, as well as Rabbi Robert Fierstein and Jean Klerman, co-chairs of the History Committee. Bella Scharf Zelingher, as Exhibits Committee Chair, designed and created all of the digital frame content and presentations. Other participants have included Marc Diament, former Timeline Committee and Exhibits Committee Chair, Bob Silverman, Jeff Wolf, and Gloria Berman. Professionals on the team are curator Howard Green of Public History Partners of Highland Park, NJ, and exhibit designer Keith Ragone of Keith Ragone Studio of Newfield, NJ. Most importantly, this exhibit would not have been possible had it not been for the generosity of Allen Shanosky of Applied Image, Inc., Freehold, fabricator of the exhibit, and Bernard “Nardi” Hochberg of Millhurst Mills, Freehold. The Museum is grateful to Rabbi Sally J. Priesand who in 2010 generously shared an exhibit of her historical memorabilia in order to provide seed funding for this project, as well as many individual donors. For more information, call the Museum at 732-252-6990, or visit www.jhmomc.org. The JHMOMC is a tax-exempt organization under Section 501 (c)(3) of the Internal Revenue Code and is handicapped accessible.